PlayStation®’s title “FREEDOM WARS (English version), a PlayStation®Vita exclusive Recapture Multi-play Action, will be available for release on October 28 this year as announced by Sony Computer Entertainment Hong Kong (SCEH) Singapore Branch last September 10. The game would fetched at PHP 1,499, while Asia-exclusive Collector’s Edition that would be released on the same day will be at PHP 2,999. As a bonus, the purchaser who would pre-order the Vita Card version at PlayStation® Authorized Dealers starting on September 9, will get "Percy Propa" Figure Strap as long as the stocks lasts. Freedom Wars is an action packed Role Playing Game (RPG) developed by Sony Computer Entertainment Japan Studio, about earth’s last human survivors who struggle with limited resources. Humans have built high walls around the cities for their protection, however the resources are scarce, resulting conflict with other states. Panopticon has implemented strict laws to have control all over the cities. People who has been proven guilty would be sentenced with imprisonment for 1 million years. 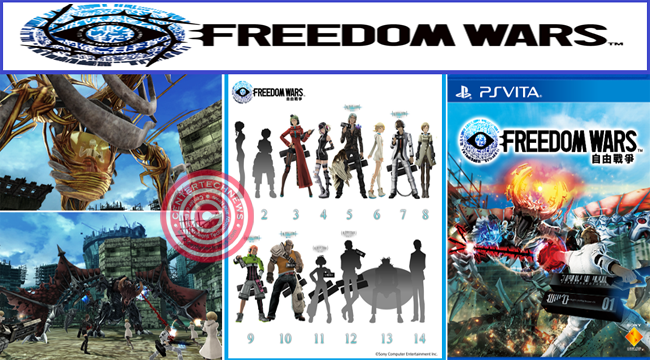 The Freedom Wars Standard English Version would still have the Japanese audio and have English subtitles in PlayStation®Vita and PlayStation®Vita TV flatform at Php 1,499. Meanwhile with the Collector’s Edition, purchaser would have a PS Vita Format software ‘Freedom Wars’ English Version and a special figure ‘Accessory’ at Php 2, 999. The game would be available upon release dates at Philippine PlayStation® authorized dealers found in malls. To have a free experience of the game, Sony invites gamers to visit the first ever PlayStation®Flagship store in Philippines in the fourth floor of SM Megamall Building A. Read more details about FREEDOM WARS (English version) below. Read more details Facts about FREEDOM WARS (English version) below.